Our President KC followed IPDG Kenneth Wong and other district leaders to visit Shanxi on Oct 18-20 to offficially handover the water purification systems to various schools . 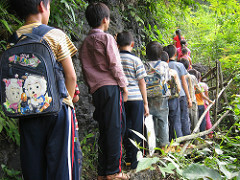 Happy faces were on the school children who can now enjoy the taste of clean water. Please visit our photo gallery for the visit highlights.